Through case studies examined in a comparative East-West approach, this book analyses how Byzantine iconoclasm (ca. 720s-843) impacted on the West and how it shaped a papal reaction in Rome. The policy on the production and veneration of sacred images that was then adopted by the popes would only be challenged 700 years later by the Protestant Reformation. The key aims and contribution of this book are its demonstration of how a number of the most iconic ways of representing the Virgin Mary and Christ - crystallized over the long Middles Ages and the early Renaissance in Byzantine, post-Byzantine, and western art - were conceived or given a reinforced meaning during the period of the iconoclasm between the West and Byzantium. 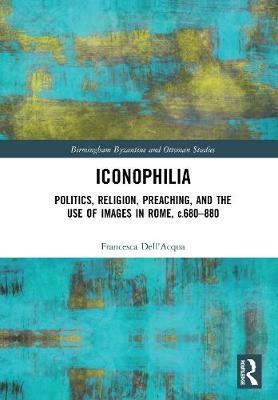 Francesca Dell'Acqua trained as a medievalist at the Universita di Firenze and at the University of East Anglia. In 2001 she received her Ph.D. at the Scuola Normale Superiore di Pisa. She is currently Marie Curie Fellow at the Centre for Byzantine, Ottoman, and Modern Greek Studies, Birmingham. She has published numerous book chapters and articles on medieval art and culture and her first monograph earned her the Hanno and Ilse Hahn Prize from the Bibliotheca Hertziana/Max-Planck-Institut fur Kunstgeschichte in 2006.